This field is part of a 160-acre tract in Saline County, Mo., that sold for $10,700 per acre in February — double what it would have gone for five years ago. Click the map to see how the price of farmland has gone up. Produced by Harvest Public Media. The high commodity prices have helped encourage investors like Steve Diggle, who have no connection to farming, to compete for their very own acreage in the Heartland. "We paid about $3.3 million for [about 650 acres] in Southeast Illinois in 2009," said Diggle, who is the CEO of Singapore-based Vulpes Investment Management. The company handles $250 million of investor money, about 15 percent of which is in farmland. Abbie Fentress Swanson reports from Missouri for Harvest Public Media, an agriculture-reporting project involving six NPR member stations in the Midwest. For more stories about farm and food, check out harvestpublicmedia.org. In much of the U.S., real estate prices have done nothing but drop in recent years, but in the Corn Belt they're hitting record highs. 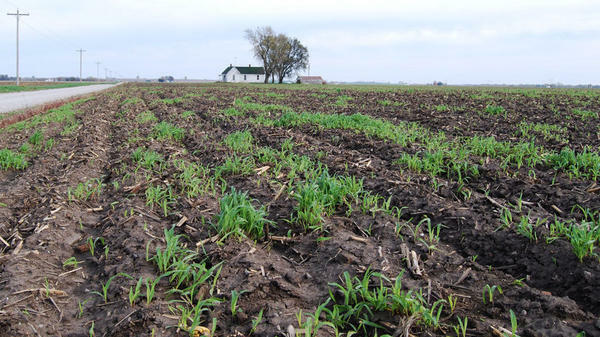 Just last month an 80-acre tract in Iowa went for nearly $22,000 an acre. That's five times more than the land sold for only five years earlier. The reason for the boom, high crop prices. In many cases, farmland is producing better returns than bonds, gold, even the stock market. The story is the same in Missouri, where Abbie Fentress Swanson reports these returns are now enticing a lot of traditional investors. ABBIE FENTRESS SWANSON, BYLINE: I'm standing here in Saline County on a piece of beautiful farmland, which is some of the best land for growing corn in Missouri. Five years ago, this piece of land would have sold for maybe 4,000, $5,000 an acre. Now that price has doubled and this piece of land sold for $10,700 an acre last year. HOWARD AUDSLEY: You want a clod? UNIDENTIFIED WOMAN: Yes, I do. SWANSON: Howard Audsley has appraised land here in Missouri for 30 years. Wearing dark glasses and a crew cut, he walks into the middle of a field on this 160-acre tract and bends his tall body to pick up a clod of dirt. As it crumbles in the wind, he explains why this land is so valuable. AUDSLEY: This is all very loamy, very productive but loamy soil. A high clay soil will just be like a rock and that's the difference between the way the soils - and the farmers know this and the investors know this, that's why they pay for it what they do. 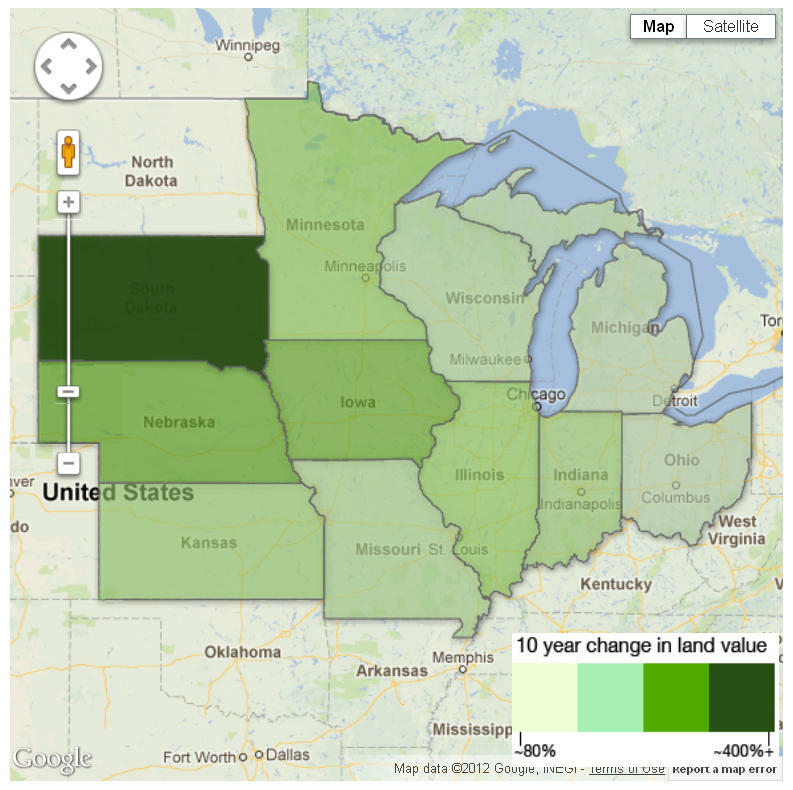 It's not just the value of Missouri cropland that's rising. Farmland prices all over the region - from Iowa to Illinois, Nebraska to Kansas - have been sky-high lately, in part thanks to corn prices topping $8 a bushel. That's helped encourage investors with no connection to farmland to compete for their very own acreage. STEVE DIGGLE: We paid about $3.3 million for our 650 acres-odd in southeast Illinois in 2009. SWANSON: Diggle is the CEO of a company called Vulpes Investment Management, which is based in Singapore. The firm manages a quarter of a billion dollars of investors' money. About 15 percent of that is in farmland. DIGGLE: This year, we sold it at auction. We got 5.1 million. That's 55 percent higher than we paid. Plus we got two yields, one of 3.5 percent and one of 5 percent. So, you know, as an investment that's 63 percent over three years is great. And we're extremely happy with it. SWANSON: Physics Professor Andy Trupin lives in Del Ray Beach, Florida. He bought farmland in Kansas two years ago because it looked like it would make him more money than gold or the stock market. ANDY TRUPIN: Farmland seemed like a much safer vehicle to get an income stream. Even though if it's not a high-income stream, at least it's more than you would get on treasuries at any duration. And, at the same time, offer price appreciation or at least hold its value in the event of an inflation period. SWANSON: But does this sound familiar? Back in 2006, a housing bubble burst in part because of rapid and ultimately unsustainable increases in housing prices. University of Missouri agriculture economist Ron Plain is concerned a similar bubble could be happening in farmland. RON PLAIN: When you're at record high crop prices, it's reasonable to expect you're going to stop being at record levels. Lower prices means less income per acre and, therefore, less ability to pay for farmland. So, yes, that's a very real possibility and a concern for investors. SWANSON: Should a bubble burst, farmland might be harder to sell, especially compared to other more liquid investments. But investors argue that any bubble is still far off and believe that farm acreage will remain a solid long-term investment so long as the demand for food continues to grow. BLOCK: That story came to us from Harvest Public Media, a Public Radio reporting project that focuses on agriculture and food production issues. Transcript provided by NPR, Copyright NPR.